KC Home Solutions was born on the handyman type of projects. Our very first paid project was removing and pouring a new concrete heating and cooling slab! From there we took on custom backsplash projects. Floor tiling. Toilet replacements. New light fixture installations. Painting. Trim work. Wood rot repair. Decks. You name it, we probably did it. Our customer service, quality of work and referrals helped us grow. Eventually our projects got larger and larger and we stepped away from the handyman style of work. We started referring the handyman type of projects to other companies. But we noticed something in our area. We could not find someone that we could refer our customers to. A company or individual that WE could trust to do quality work at a fair price. That is no longer our answer. Our handyman service division is back. We have your back for any project in your home. No project is too small! We are bringing our award-winning remodeling results and applying that customer service and attention to detail to all of your homes needs. From doorknobs to dream homes, we are your solution! Wouldn’t you rather save for the remodel you WANT to do rather than the repair you HAVE to do? 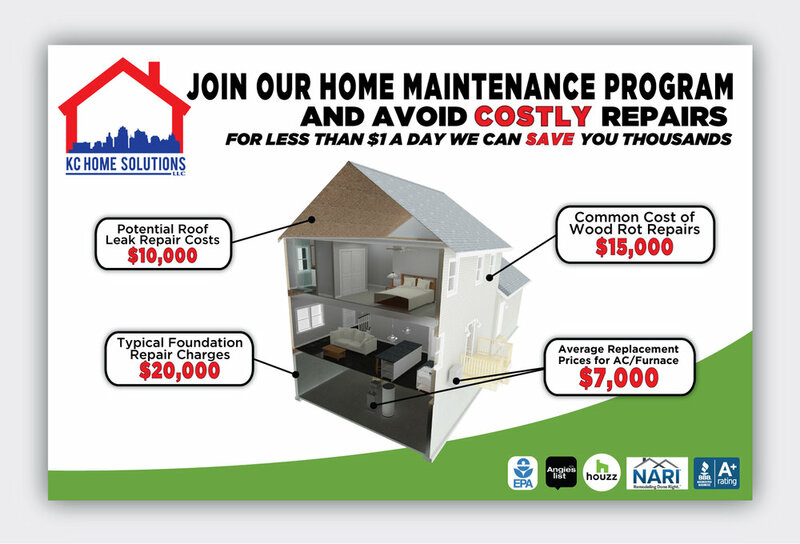 Our Home Maintenance Program is how you can do that. Not many people devote time throughout the year to check on all of the needs of their home. And who really wants to do all of the other smaller tasks like cleaning gutters that once clogged can lead to wood rot damage? Check out the details below and how we can help you save thousands on unwanted repair items. By joining the Home Maintenance Program you will also get discounts off of our handyman standard hourly rate AND a discount on your next remodeling project! Call us today to get your home protected.